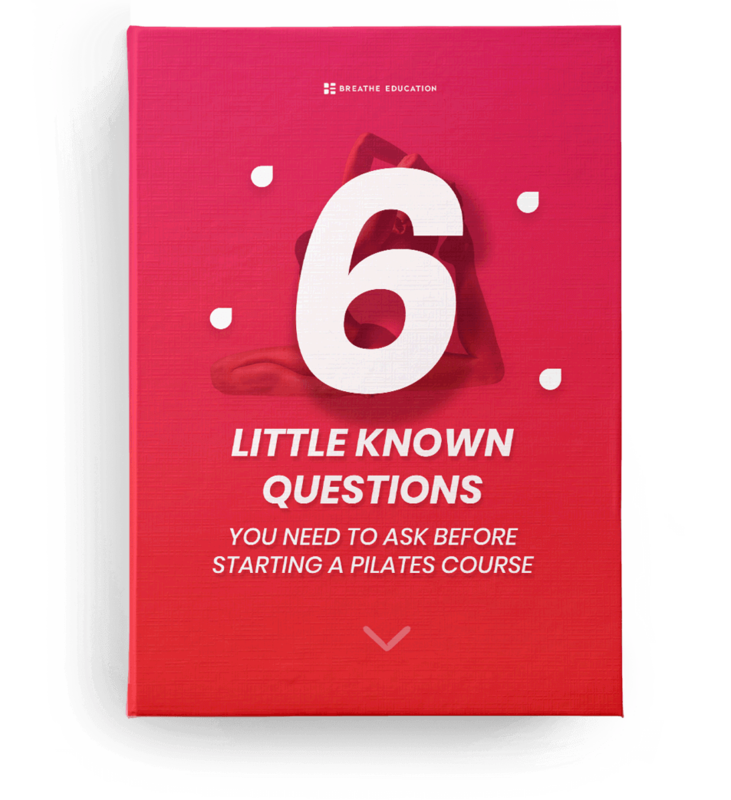 But before you get started, make sure you have all the information you need to make the right choice by downloading your FREE copy of our report ‘6 Little Known Questions You Need to Ask BEFORE Starting a Pilates Course’. Are you feeling trapped behind a desk? Stuck at home all day? Or perhaps you already work with clients as an allied health professional, or in the fitness industry, and you feel like you want a deeper understanding of biomechanics, and the science behind Pilates. Whatever your situation, taking up a Breathe Education Pilates course will teach you everything you need to know to become a fully qualified Pilates Instructor. Over the past decade Pilates has become a staple in gyms, rehabilitation clinics and wellbeing studios and qualified instructors are in huge demand. With the Pilates industry booming worldwide there’s never been a better time to get started. So whether you’re a manual therapist wanting to add Pilates to your scope, an exercise professional looking to broaden your skills, a corporate executive looking for a lifestyle change, or you just love Pilates and want to teach and share that love with others, we have the perfect course to get you started on your path to a new life and new career. Since 2008 Breathe Education has run hundreds of courses, training thousands of instructors. The reason we’re so popular is because our courses aren’t just about memorising movements. We help you focus on learning the biomechanics behind the exercises, and how they affect the body. This science-based approach is why so many physiotherapists, exercise physiologists, osteopaths and other rehabilitation professionals choose to study with us. Just as importantly, all of our courses are government accredited, which means you’ll receive a nationally recognised qualification, recognised by law throughout Australia. In fact, we provide Australia’s ONLY nationally recognised Clinical Pilates Course. Since 2008 we’ve proudly certified more than 1,100 Pilates instructors. Breathe Education’s evidence-based, fully government accredited Certificate IV and Diploma courses have developed over time to sit proudly at the vanguard of Pilates teacher education. Pilates has fast become one of Australia’s most popular physical exercise systems. Developed in the early 20th century, Pilates is favoured by Australians for many reasons. For some, they take Pilates classes to better their concentration. For others they practise Pilates to increase flow of movement or self-control. For many, Pilates provides a means of conditioning the abdominal muscles or alleviating lower back pain. It offers a very different kind of workout, with many physical and mental benefits. It puts emphasis on alignment, breathing, developing a strong core and improving coordination and balance. What’s not to love? Such is the demand for Pilates classes in Sydney that it’s often hard to find a place in a class. As Pilates exercises can be moderated to meet levels of difficulty, it suits a wide range of people of all ages and abilities. Pilates classes have never been more in demand and of course, qualified Pilates instructors have never been so in demand in Sydney as a result. Fitness studios, gyms, leisure facilities and wellness centres right across Australia are all crying out for properly certified instructors. However, to be a true Pilates instructor, taking a weekend course just won’t cut it. If you’re serious about leading a Pilates revolution in your area, you need to enrol in the best Pilates Instructor Course Sydney has to offer. Breathe Education offer the number one Pilates instructor course in Australia. We want to equip instructors with the knowledge and skills to deliver the best possible Pilates classes for their clients. If you want to deliver a Pilates class that has people vying for places every week, you need to understand about the biomechanics of Pilates and how and why it affects the body in such a positive way. With Breathe Education, you can gain a Nationally Recognised Certificate IV in Pilates that will enable you to teach classes of a high standard. It can also enable you to go on to a professional level with a Diploma in Clinical Pilates. Our teaching staff are highly qualified so you can be guaranteed that you’ll be learning from the very best. We’ll equip you with the practical skills and detailed anatomical knowledge necessary to gain an instructor’s role at an existing studio. You can even go out and start your own studio after completing our Pilates instructor course. It doesn’t matter what your background is. If you want to pursue a career, even on a part-time basis as a Pilates instructor, we’ll help you be the best instructor that you can be. Get the recognised qualification that makes you a true Pilates instructor. Talk to Breathe Education about our range of instructor courses and start your journey towards a new, invigorating and self-fulfilling career today. highly sought after Pilates instructor course in Adelaide. To be the best, you must learn from the best. If you want to study a pilates instructor course, Sydney is not the right city to be studying in until Breathe Education opens a branch there. Until we do, you’ll have to study at either our main campus in Melbourne, or at the campus on the Gold Coast. Naturally there are pilates courses in Sydney, but they really don’t come close to what is offered through Breathe Education. Our fully accredited Pilates Certification and Diploma Pilates have set the standard for what a pilates instructor course should be. Nationally recognised under the Australian Qualifications Framework (AQF) and accepted by the Pilates Alliance of Australasia (PAA) and Exercise & Sport Science Australia (ESSA), these are among the strongest qualifications you can possess in the health and fitness industry below the level of undertaking a full university course. In fact many people who have completed university courses all the way up to doctorate level have chosen to supplement their skills and knowledge by participating in these classes as well. One of the reasons for this is that Breathe Education has earned a solid reputation as an outstanding training provider, with a strong curriculum, excellent staff, and state of the art technology to support your learning. When you study with Breathe Education, you will be learning all the skills you need in order to become a top class pilates instructor. Your skills will be recognised throughout Australia, and may also be accepted in many other countries as proof of your professional training. As a pilates instructor, you will have a lot of responsibility resting on your shoulders. Your clients will be relying on you for their safety and well-being. Therefore it is important to make sure you have the proper training and knowledge before you get into this kind of work. There are no shortcuts. Courses that don’t prepare you properly could leave you exposed to potential legal liability and professional embarrassment. This is why studying with Breathe Education is the best choice. The skills you learn cover much more than just pilates, and you will be picking up skills that you can apply to other areas of your life as well. These include teaching and coaching skills, plus training in safety, law, and ethics. All of this is taught by experienced staff whom are dedicated to helping you reach your full potential. Once you have graduated, you should find there are plenty of employment opportunities available to you, because there is a strong demand for pilates instructors. Those who have the resources may also elect to create their own studio and be their own boss. It’s a great career choice that is financially rewarding and immensely satisfying on many other levels as well. Who Can Benefit From Studying With Us? It doesn’t matter if you’re a stay-at-home mum who wants a new career or you’d like to exit the rat race and start your own studio, we’ve got the right training for you. We even have allied health professionals from fields such as Osteopathy and Physiotherapy study with us to gain a wider range of tools and experience with which to treat their patients. If you’d like to properly understand movement as opposed to just a list of exercises, then taking a course with Breathe is your next step. As a highly qualified Pilates instructor you’ll be welcomed into thriving local and global communities of like-minded souls. After you graduate, your sense of curiosity never stops and your Pilates community is a thriving source of social support and shared life-long learning. Be Connected! When you start training, you’ll be unlocking further potential in a deeply rewarding Pilates career. But, that doesn’t mean you’re locked into anything. We give you a full 30 days from your date of enrolment to determine if this course is right for you and your goals.If at any time over your first 30 days of study you feel you don’t want to continue, just let us know. We’ll give you a complete refund and even let you keep any hard-copy course materials you have received in case you want to give it another go in the future. For a limited time, you can get a free 20-minute Discovery Call with one of our Pilates Trainers. On the call we’ll review your individual needs, situation and career goals with you. Then, based on what you tell us, we’ll let you know which course is the best fit for you. We’ll tailor a plan specifically for you once we’ve had a chance to understand your situation. And we’ll answer any questions you have about our courses or about life as a Pilates Instructor. After all nothing beats hearing from someone who’s travelled the same path as you want to travel. And don’t worry, there is no charge for this and there’s no catch. You’re under no obligation to take up one of our courses, come in to see us, or anything else. We’re always happy to have a chat about Pilates and our experiences in the industry. Claim your complimentary 20-minute Discovery Call now. But hurry, spots are limited!